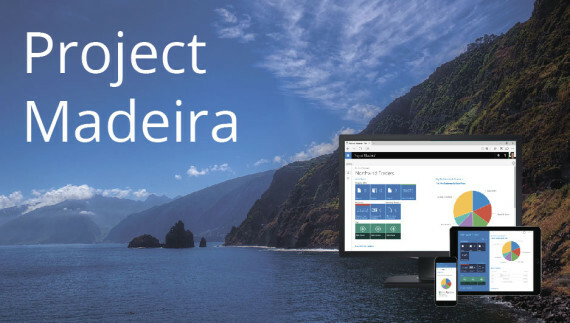 Microsoft continues to acquaint us with the World geography and this time offers to taste and evaluate Madeira. For those who have forgotten the naming rules of Microsoft’s new products it’s not only the Portugal island, the place of birth of Cristiano Ronaldo, but the working title of the upcoming version of NAV. From a certain moment this kind of news are perceived not only with interest, but with caution as well. New issues of Microsoft Dynamics products are getting more and more revolutionary. However, this evaluation comes from the aging conservative, worried about the corporate sector. For the progressive enthusiasts living and breathing the 21st century the direction of Microsoft evolution looks promising. Project Madeira is the first product from the eminent manufacturer in a “cloud” class of ERP systems (ERP as SaaS). It is aimed primarily for use on mobile devices. Start page bears resemblance to the existing NAV2016 web-client. The same Role Center with tiles, charts and navigation pane. Classic role oriented desktop in client application is not present at all. Yes, it’s a slightly different product. Because of the focus on the mobile devices (tablets primarily, as I imagine), Touch-functions here are brought to perfection. For example, the list of products can be presented in several ways: boring list to which we are already accustomed to (one could say “are getting tired of”), matrix gallery of images with a brief description and a horizontal list with images to scroll. It should be noted that the cloud ERP from Microsoft did not appear in a vacuum: other services for small businesses in the United States has long been quite popular. Look at QuickBooks, for example. In fact, it is a fairly simple system for simple day to day operations, similar to Russian Elba or.Kontur. Microsoft has decided to oust or at least to press these services with its presence on the market, that’s why Madera contains the necessary tools for migrating from some of these solutions which are the most popular among American SMBs. For the convenience of Small Business users Microsoft introduces the “out of the box” integration with PayPal and other lesser-known bank processing services. Well, what else is needed for a small family business? Maybe, the integration with the Federal Tax Service?